The ethical question implied by discreparcies between the distribution of income and the economic foundations of our country is at the heart of much of today's political debate. The answer according to the left-and often the mainstream media-would require major changes in the way our economy functions so as to further redistribute income among households. Higher tax rates on the upper middle class and rich, more restrictive corporate regulations (including higher taxes), more centralized economic planning, in short more governmental intervention into the free market, would all be in our future-and their deleterious effects would soon begin working their way into American life, according to Paul Ryscavage in Rethinking the Income Gap. This book is written by an economist who has spent his career studying and analyzing income inequality. News reports of mushrooming fortunes, most recently among CEOs and hedge fund managers, alongside reports of a struggling middle class and an intractable poverty class, have been common topics for the nation's media. Ryscavage asserts that the media has misused many of the facts surrounding the increase in income inequality. He calls for a reexamination of the facts and what they mean and do not mean-and ultimately shows that, contrary to media reports, income inequality can no longer be used as a measure of economic fairness. He also writes that, notwithstanding the economic downturn of 2008, the "real" news that the media have not reported is the expansion in recent decades of our nation's middle class, especially the upper middle class. 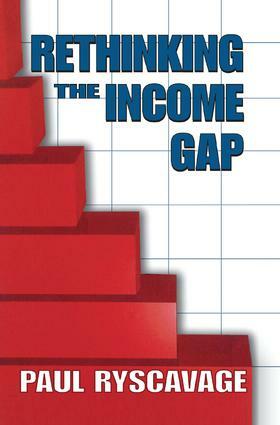 Ryscavage argues that we must reexamine what the income gap means. Its relevance as a measure of economic fairness has diminished significantly in recent years. Instead, the income gap is now linked to a variety of economic problems confronting the nation and used as a rhetorical device for stirring up social concern and advancing political agendas. Rethinking the income gap is overdue. This book does just that. Introduction You…and the Income Gap! So, Forget about the CEOs and the Top 1 Percent! Good Inequality vs. Bad Inequality?